​What skills, knowledge and abilities do individuals need to possess to be an effective jail leader? ​How can organizations grow their next leaders? ​Leadership development remains a priority for the profession. Members of the Baby Boomer generation are retiring each day, and specific initiatives to prepare the next leaders lag behind the needs. Leadership development doesn’t happen in the boss’s office or in a closed conference room. The initiative needs to have vision, be shared, and enlist supporters through the community. Jail leadership is a public safety issue. To be successful, the initiative must have transparency and inclusion. ​This toolkit is intended to provide the foundational information needed by jails to jump start or refine leadership development programs. Providing foundational ideas means that jail leaders will need to invest time in their exploration of ideas presented here. ​The competencies define the specific skills, knowledge and abilities needed by jail leaders. 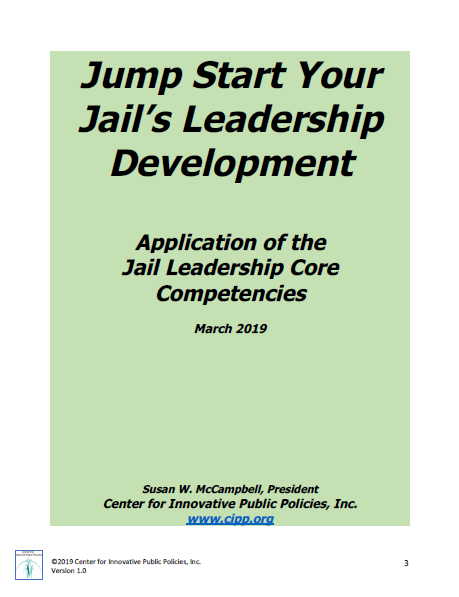 Articles, published in American Jails, expand on each of the competencies and provide information to use to activate a leadership program, including resources and a suggested leadership library. For a personal leadership development assessment, a checklist is provided for a self-rating. Using this information can inform the reader’s own leadership needs and plot the journey. Jail leaders, emerging leaders, mid-managers, supervisors, including jail training personnel. Local and state criminal justice policy and decision-makers. Public safety colleagues outside corrections/jails. Identify objective information to hire, promote, and develop jail professionals. Provide opportunities for professional and personal growth. Inform decision-makers, funders, the community and business regarding the skills, knowledges and abilities needed to lead jails. Identify platforms for collaboration with other public agencies needing to develop the next generation of leaders. Establish cost effective strategies to develop leaders. Give an evidence-base to human resources’ functions – update/develop job descriptions, promotional processes, and training.